When you accidentally delete an item from your mailbox, you can often recover it. The first place to look for a deleted item, such as an email message, calendar appointment, contact, or task is the Deleted Items folder. If it's not there, you might still be able to recover it by using Recover deleted items, depending on settings that are controlled by your IT administrator. When you delete an email message, contact, calendar item, or task, it's moved to the Deleted Items folder. In your email folder list, select Deleted Items. To restore a message to your inbox, right-click the message, then select Move > Inbox. 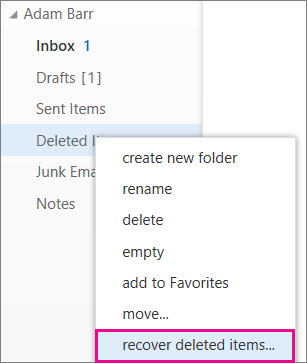 To restore a message to a different folder, right-click the message, then select Move > More. Choose a folder location and then select Move. To restore a contact, right-click it, then select Move to Contacts. To restore a calendar item, right-click it, then select Move to Calendar. To restore a task, right-click it, then select Move to Tasks. If you delete a folder, it's moved to the Deleted Items folder and appears as a subfolder. To recover it (and all the items it contains), right-click the deleted folder, select Move, and then select a folder to move it to. Your admin might have set up a policy to delete items from your Deleted Items folder after a certain number of days. Just like when you deleted an item, items deleted by a policy are moved to the Recoverable Items folder. So if you can't find something in your Deleted Items folder, look for it in the Recoverable Items folder. They're deleted from the Deleted Items folder. The Deleted Items folder is emptied, either by you or by a policy set by your IT administrator. You delete an item by selecting it and pressing Shift+Delete. 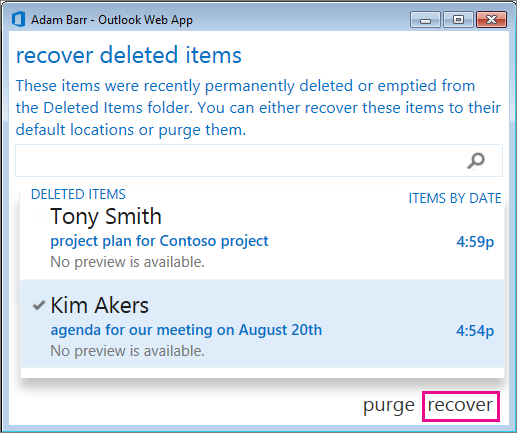 In your email folder list, right-click Deleted Items, then select Recover deleted items. If necessary, use the search box to find the item you want to recover. When you find the item, select it, and then select Recover. Recovered items are moved to the default location for each item type. The deleted date for an item in the Recoverable Items folder is when the item was moved to the Deleted Items folder. It's not the date the item was moved to the Recoverable Items folder. Items in the Recoverable Items folder don't have icons, so they all look very similar. If you're looking for a contact, look for an item that has the name of the person, but no subject line. If you're looking for a calendar appointment, look for an item that doesn't have a person's name or a subject line. If you're looking for a contact, calendar appointment, or a task look for the text of that item. To recover multiple items, hover over each item and select the checkbox next to it, select Recover. You can also recover multiple adjacent items by selecting the checkbox for first item, holding down the Shift key, and then selecting the checkbox for the last item. When all items are selected, select Recover. You can purge items from the Recover deleted items list. Just select the item and then select Purge. If you purge an item, you won't be able to use Recover deleted items to get it back. Purging a message won't remove it from any backups that were made before you purged it. Your organization might have specified how long items in the Recoverable Items folder are available for recovery. For example, there might be a policy that deletes anything that’s been in your Deleted Items folder for 30 days and another policy that lets you recover items in the Recoverable Items folder for up to another 14 days.